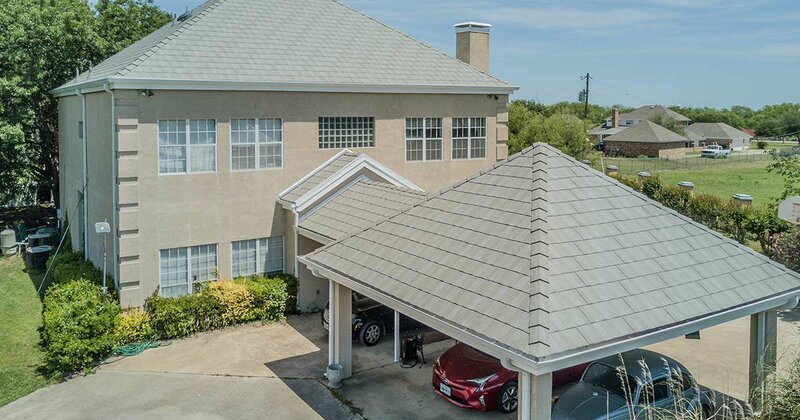 A North Texas homeowner looking to replace the home’s concrete tile roof that was damaged by hail searched high and low for a more durable and attractive choice. During an online search, she found the Milan metal roofing profile available from MRA member, McElroy Metal. Milan is available in a shake or a slate profile in a variety of PVDF color options. It’s installed from the eaves up to the ridge and provides the look of dimensional shingles, slate or cedar shake. It offers the lasting strength and durability of steel roofing with state-of-the-art coatings. The interlocking Milan panels resist high winds, while the quality G90 galvanized steel provides fire protection. At one-fourth the weight of conventional asphalt roofing shingles, in some cases, Milan can be installed over existing roofs. Approximately 4,600 square feet of Milan Slate in the color “Green Slate” was installed by Maximum Construction. The project was completed in November 2016. Since 1963, McElroy Metal has served the construction industry with quality products and excellent customer service. The family-owned components manufacturer is headquartered in Bossier City, La., and has 12 manufacturing facilities across the United States. Quality, service and performance have been the cornerstone of McElroy Metal’s business philosophy and have contributed to the success of the company through the years. More information can be found at http://www.mcelroymetal.com.